BOOM. Curiously Wikipedia failed me on this one, forcing me to trawl Google image search for a decent diagram that explained how sunspots are formed step-by-step because I’ll be damned if I’m doing it without one. Addison Wesley, I do not know if you are a person or a textbook publishing company or whatever, but you make good diagrams. I’m stealing them. which means that if you plug in the temperature of a sunspot (3000 – 4500K) and the temperature of the Sun’s photosphere (5750K) into this equation, you get some numbers that say sunspots are between 1 and 30 percent as luminous as the rest of the Sun. Because sunspots are so dim and the Sun is so bright, this makes sunspots appear to us as dark patches on the Sun’s surface. Wikipedia tells me that if you looked at a sunspot on its own it’d be about as bright as an arc lamp; I don’t know what an arc lamp is but it sounds pretty bright. 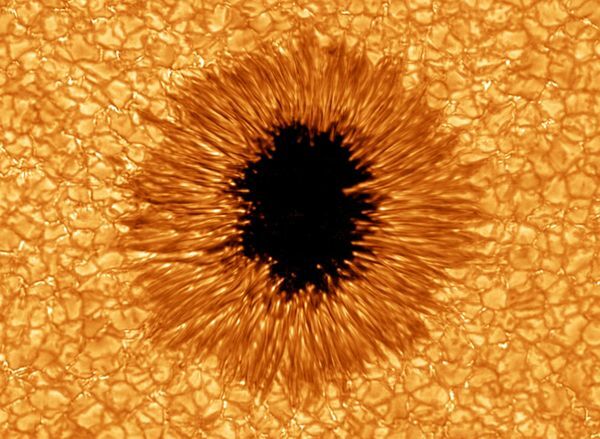 Sunspots are only dark because they’re comparatively dim, not because they’re actually dim. 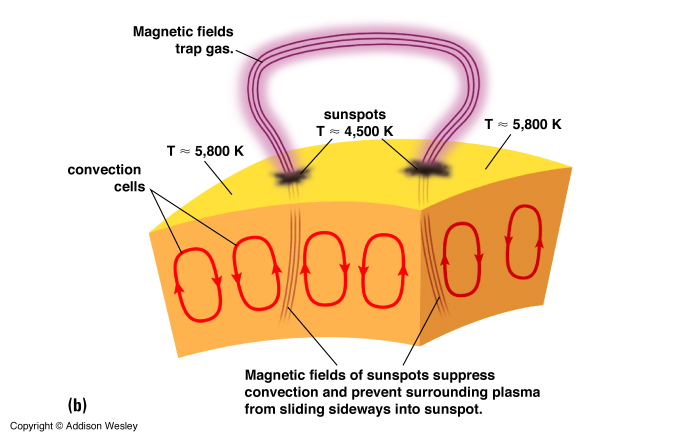 Because the magnetic loop punctures the Sun’s surface in two places that are close to one another, sunspots almost always occur in matching pairs. 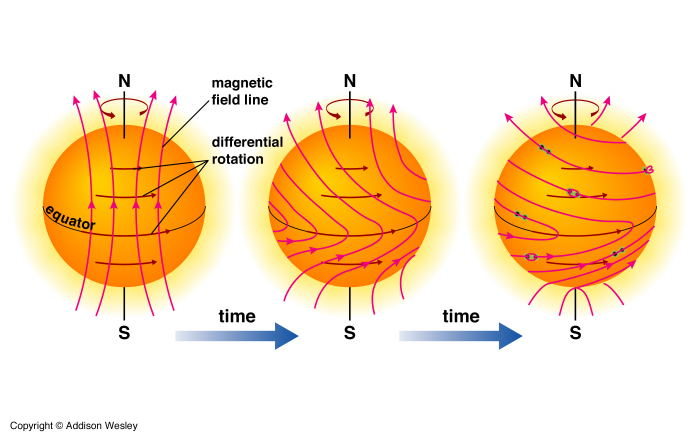 Now, after the magnetic field lines become all mangled like that the Sun basically says “Whoa now, things are getting a little out of hand!” and promptly resets its magnetic field back to what it was before; the actual physics behind this can be broadly understood as the magnetic field lines becoming so twisted that they end up at a complete 180 to where they started out, which is why every time there’s a magnetic field “reset” the polarity of the Sun’s magnetic reverses and then the differential rotation process starts all over again. This is the solar cycle, with the Sun undergoing one polarity reversal every 11 years, and it’s very important for understanding space weather because the Sun gets more volatile as its magnetic field grows increasingly out of whack. 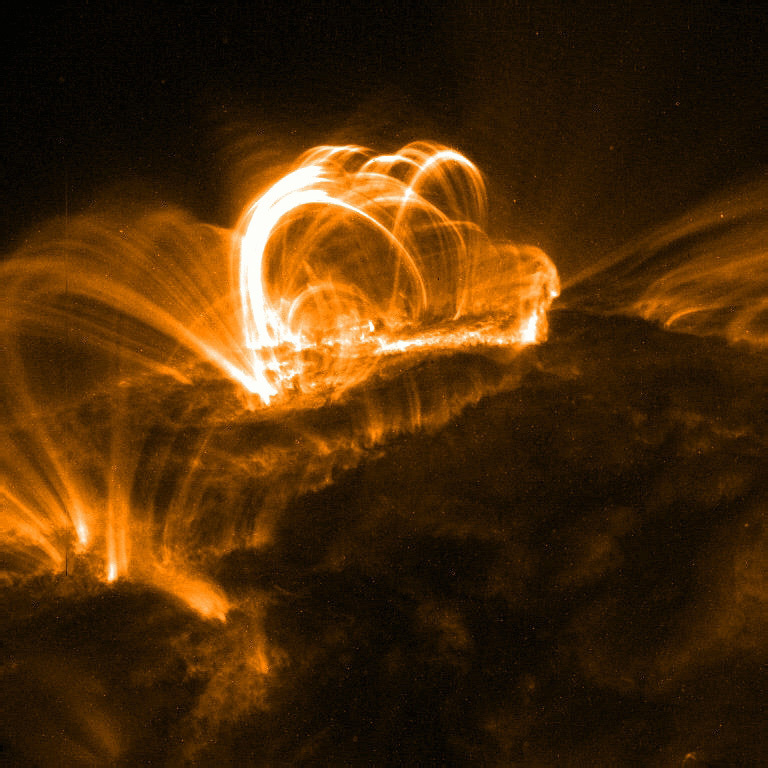 Solar flares and CMEs tend to originate from the areas in which sunspots have formed, while the Sun just generally vomits out more electromagnetic radiation when going through a sunspot phase which can swamp the Earth and really mess up certain bits and pieces of our technology which rely heavily on the transmission of electromagnetic waves, like radio. This is why you’ll sometimes hear astronomers refer to the solar cycle, solar maxima and minima and the sunspot cycle. When there are no sunspots, the magnetic field of the Sun is relatively well-ordered and it is in a solar minima with minimal activity. As the solar cycle progresses and the magnetic field becomes more twisted, sunspots begin to appear and solar activity ramps up. Towards the end of the eleven year cycle there are many clusters of sunspots to be found on the Sun’s surface thanks to the highly misshapen magnetic field lines and there’s a marked increase in the occurence of violent solar events like coronal mass ejections. Then the field reverses and resets, the sunspots disappear and the Sun becomes relatively calm again. And that’s what sunspots are: literally Sun acne. Hope this helps! One question, how come the field lines at the initial state (lines are not distorted) don’t make sunspots at the poles. At the poles the magnetic lines are exiting and entering, at least initially. Hey yeah that is a good question. People reading your entire backlog want to know! holy crap, you don’t know how helpful you’ve been to me today. I have a sunspot 3D model project due in a week and every website I’ve consulted has been written in high-level astronomy language BS that no college freshman could possibly decipher. I propose you get to work on a textbook immediately. Much obliged.